Many of us consider the music of Pasquale Taraffo (1887-1937) the pinnacle of harp guitar playing of the 20th – or any other – century. He even earned a legendary nickname – “U Roa,” (“The Wheel”) – for his inimitable right hand/arm motion. 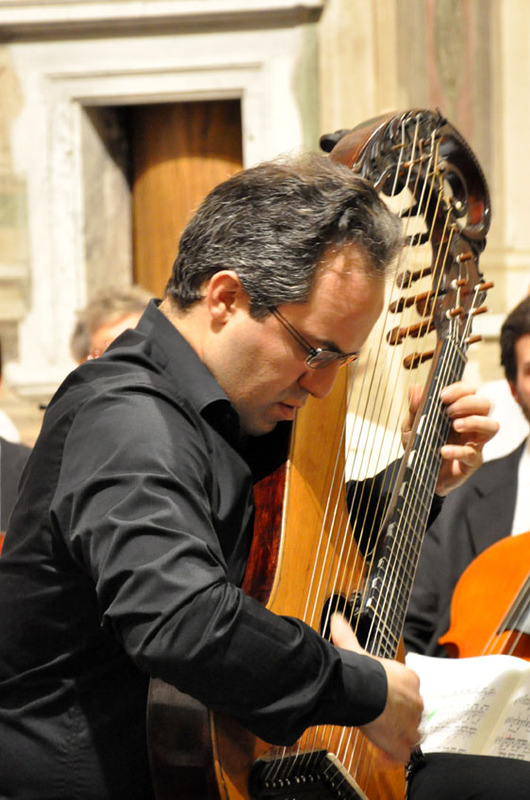 Of course, choosing to commission (from local luthier, Settimio Gazzo) one of the most elaborate harp guitars ever designed, then setting it on a stand to present a bold, theatrical performance, certainly added to his success and worldwide fame. Perhaps the most spectacular aspect of Taraffo’s prodigious technique (self-taught?…I tend to think so) was his inexplicable “machine-gun-like” tremolo, the subject of much conjecture and debate among Taraffo-philes. On his preserved recordings, it sounds like he is playing two or three parts at once – and it’s not an “illusion,” because, when slowed down, one can hear that the tremolo is mostly continuous. In other words, it is obviously not the common classical tremolo where each a-m-i single note melody figure is interrupted by a thumb note on a different string. Beppe Gambetta and I used to think that only a back and forth motion of the 3rd finger (akin to a South American harp technique), whilst simultaneously playing bass and chord with the thumb and remaining fingers, was the only way to explain what we were hearing. There is even a rumor of someone witnessing Taraffo use such a technique. It was this theoretical motion that I described to the audience of our Taraffo/Harp Guitar presentation in Genoa in April, 2010. I later changed my mind after listening closer to half-speed audio of certain recordings, and also watching the video at slow speeds. While he doesn’t do tremolo in the video, his unusual melody plucking pattern offers another clue; he never uses a normal (or intuitive) two-finger pattern, but always a-m-i, in a “round” (as they are 16th notes occurring in 4/4). With this in mind, it then became easier to hear the timbre changes in the slowed-down audio recordings that pointed to this same a-m-i pattern during his tremolo. Though it has taken me my usual long-winded introduction to get to the point, Christian is the subject of this article – as so dramatically referenced in my title. But it is no hyperbole. He’s the real deal. And Franco and I are beside ourselves with pride. I must admit that I had not previously heard of him, other than through Franco, who instigated this groundbreaking project. It turns out that 37-year-old Christian – whose impressive credentials I’ll list at the close – has long been a virtuoso guitarist in a wide variety of styles: classical, flamenco, electric (I love how a bio he sent me mentioned how he “specialized in the guitar parts of King Crimson songs”). Christian first started playing harp guitar in 2006 – a simple 9-string (3 sub-bass) Mozzani. Once Franco suggested it, Christian tells me “I decided to study Taraffo’s technique and compositions because I’m convinced that he is the best harp guitarist ever; I can learn so many things from his recordings.” Franco supplied him with the required 8-bass harp guitar, having Antonello Saccu retrofit his distinctive Priano with eight nylon basses (a risky maneuver, but it seems to have worked remarkably well). Frankly, I am stunned at how quickly Christian managed to learn the technique, apply it, transcribe the Taraffo piece (Cavalleria), and perform it on a 14-string harp guitar at a public concert on June 3, 2011 (these are photos from that concert). Video of that performance will be available soon, presented by Franco and myself. Just recently, over two short weeks at Franco’s home, he finished working on two additional Taraffo pieces, which we are now honored to share with you. These initial recordings were done in Franco’s home, after which I mixed them (no editing – these are single live takes). They hope to produce professional recordings in the future. I think it’s important to note that these are not slavish “copies” of Tarrafo’s arrangements and performances. As interesting as that might be, such an undertaking would be a bit soulless and pointless. Instead, Christian makes these Taraffo classics his own; indeed, in many ways (dare I say it?! ), he may be more musical and more of a virtuoso than even Taraffo. Christian takes a break from work on the recordings at Franco’s home in Camogli last month. 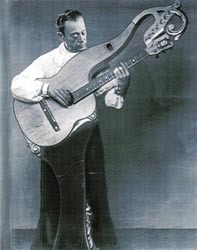 This is his back-up harp guitar, made by Hinz (Vienna). In the end (and this is only the beginning), I guess tackling Taraffo wasn’t impossible after all. 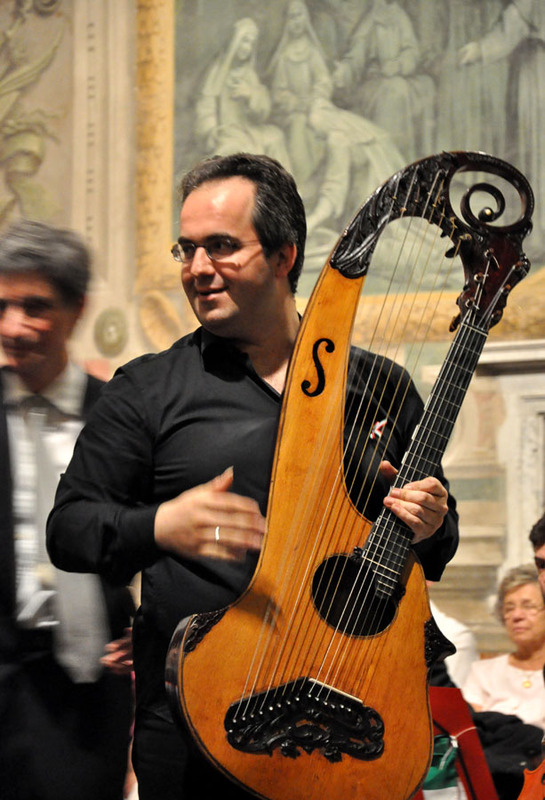 It simply took a passionate patron of the arts (Franco), an instrument (Franco and Antonello), and a singular virtuoso who decided to take on the first serious examination of this remarkable historical harp guitar music – Christian Saggese. Please enjoy these generous donations to Harpguitars.net: the world’s first recordings to re-create the full magnificence of Taraffo’s playing. 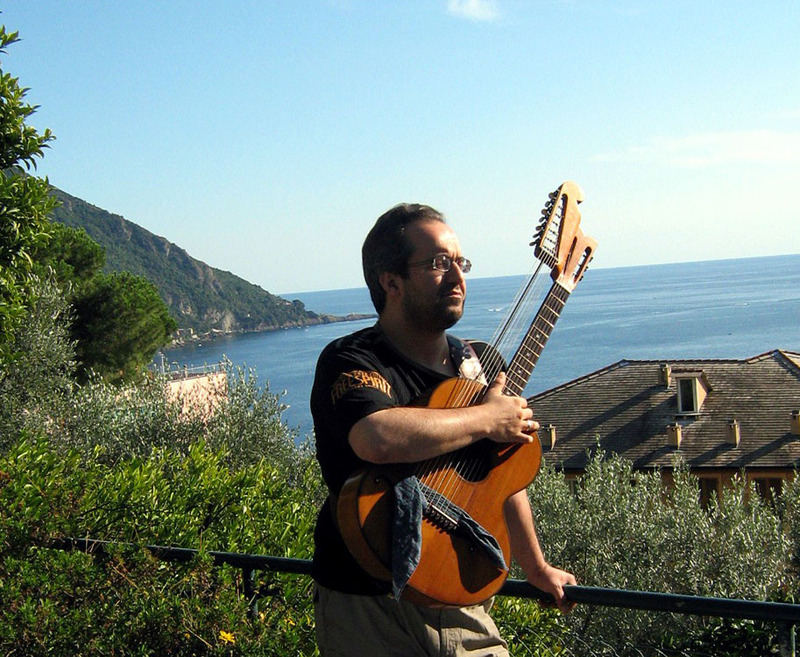 Born in Asti, Italy in 1974, Christian started playing classical guitar when he was 11. He attended the Antonio Vivaldi Conservatory in Alessandria, where in 1994 he received a diploma in guitar with the highest mark of 10 out of 10, under his teacher Angelo Gilardino. He next attended the International Advanced Academy of Music in Biella for three years, where in 1997 he received the “Excellent” diploma. Other group work has included a duo with American flautist Marlaena Kessick, the Metamorfosi Trio and the Angelo Gilardino Quartet. He has worked with Mauricio Kagel, Gyorgy Kurtàg, Tony Levin, Adrian Belew, Pat Mastelotto, Marco Minneman, Julie Slick, Michael Bernier, Mick Karn, Janne Schaffer, Jerry Marotta, Ares Tavolazzi, Mike Keneally, Pamelia Kurstin, Tom Griesgraber, and Marlaena Kessick. He also plays in a duo with Sharon Selman (dramatic coloratura soprano). He has played several International Guitar Festivals in Italy, UK, Japan, France, Spain, Havaii and South America. In 2003, he recorded an album titled “My Favorite Things: a guitar recital by Christian Saggese”. Among the musicians who have contributed to his musical training are: Vladimir HOROWITZ, Ida PRESTI, Arturo BENEDETTI MICHELANGELI, Pasquale TARAFFO, Demetrio STRATOS, Jaco PASTORIUS…. His main guitar was built by luthier Mario GARRONE (Acqui Terme, Italy). He currently plays classical and electric guitar, 14-string harp-guitar, mandolin, all in different musical styles. The Spanish newspaper “EL PAIS” considers him “….among the best European guitarists”. Thanks for sharing this! I’m a big Taraffo fan—albeit one whose renditions are far from authentic and on only six strings. Saggese is a masterful player and it’s truly a blast to hear his harp guitar performances of Taraffo’s piece. Thanks for your continuing great work! Hello to all of you, I’m glad you like my recordings. A big thanks to my friends Gregg Miner and Franco Ghisalberti !! can’t wait to see a video of you playin the harp guitar! Hello to all of you, my next recording will be the Taraffo “Sonatina in A major” , I hope you will enjoy my version. FANTASTIC!!!! Looking forward to hearing L’Onda…..